There are two types of people in this world: ones that are out and about and those others who prefer to be discreet, and no, not the gender preferences of people, rather the two types in a relationship. Sometimes people simply shock us with the news that they already got married; some not with the idea of marriage but with the fact that they all along had someone to spend their whole life with. People are just partly secretive by nature. You may also see sample postcard designs. And, if you are the type of person who wishes to do just that, to secretly get married and tell people afterwards, then there is an effective way you can do so. Although we live in a more technological age, where everyone is simply a click away, going for something more tangible that shows formality and sincerity is still a better option than simply typing away the words to relay your message. You may also see wedding invitation postcards. That is why, those people who secretly marries opt for a just married postcard to announce to the people they love the monumental affair they secretly did, simply because it makes everything more special despite the shock. 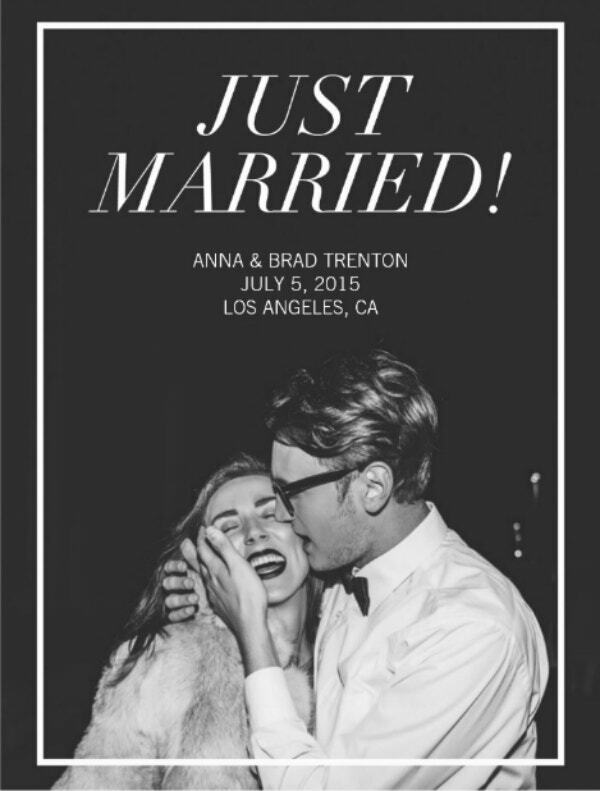 And you can opt for just the same too, a just married postcard for your little secret endeavor. That said, here is a list of just married postcards you can send out to the people you love. You may also see event postcard templates. Although it will come as a shock to most people, postcards pose itself as a delicate medium that relays the message with fragility. It makes everything less aggravating and will simply make the process a lot easier, especially when you cannot confront the responsibility of saying it to the people dear to you. You may also see printable postcard templates. However, when you have already dropped hints along the way and is somehow certain that it will not come as a shock to them, simply use a postcard to confirm their speculations and to let them in on the joyfulness of the affair. You simply cannot deny the feeling of having the people you love most celebrate with you this incredible milestone and shift in your life. You may also see blank postcard templates. You just simply have to get rid of the doubt you feel and simply let yourself go, as they say, “the truth will set you free” and indeed it will. Do not allow yourself to be imprisoned by a secret because of unnecessary thoughts you have with people and their reaction. Simply let it go and spill it, they will be shocked for sure, but eventually, they will be proud and happy for the both of you. You may also see advertising postcard templates. Just married postcards not only work when you have kept your marriage under the radar, as it also works as a post-wedding giveaway. Something you give your guests as a gesture of gratitude for coming to your wedding. It can perfectly substitute any giveaway with its intangible effects. For giveaways do not need to be fancy, it just has to be creatively thought about. You may also see holiday postcard templates. One of the beauties of having a just married postcard is your guests getting to keep it for keepsakes. They get to keep it for as long as they live and look back on the memories, more so emotions, the postcard entails. The shock, the bliss, the pride, all these they will be able to feel once more with the postcard. You may also see photo postcard templates. 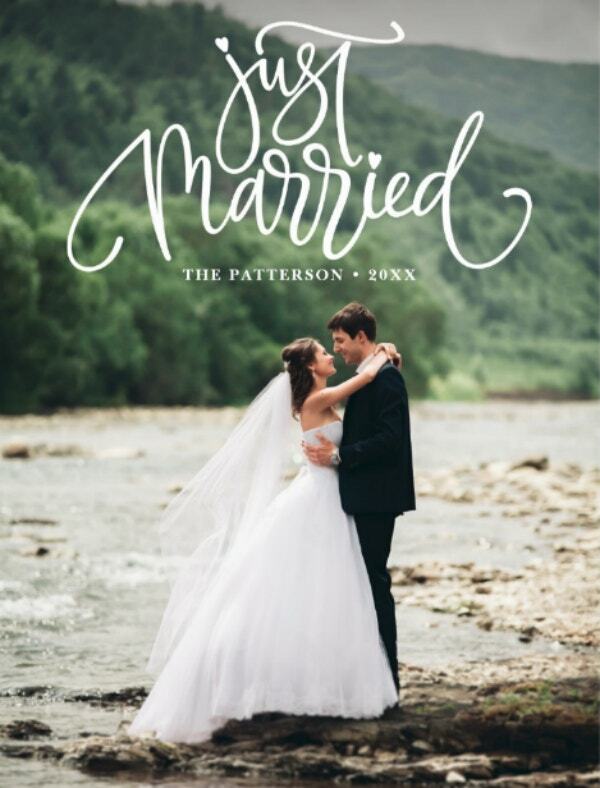 And because taking the time and effort to create just married postcards for your guests is an effort all on its own, there is the high tendency they will feel loved and appreciated. The gesture, in a way, acknowledges the individual and will simply translate as thoughtfulness for remembering them to tell about the special occasion. You may also see postcard templates. The gesture of handing out just married postcards simply elicit sincerity to your guests. It will give them the impression that you care about what they think and about what they feel, and that you also want them to be in on the emotions you will feel getting married. The bliss, the excitement, the love, and all the crazy beautiful emotions you feel while walking down the aisle. And the thought that you want them to celebrate with you and feel the same emotions as you, is something that will translate as sincerity. You may also see vintage postcard templates. 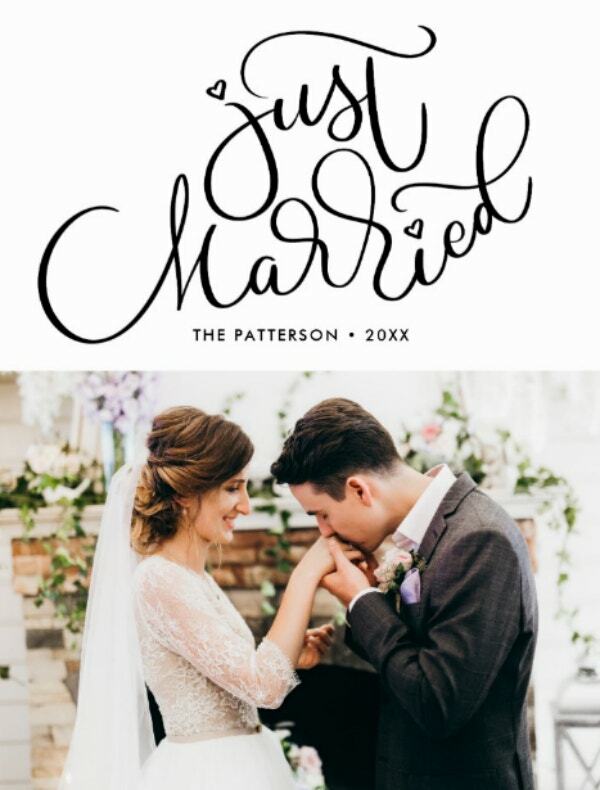 If you plan to make your just married postcards, not just cards you give out as a symbol of gratitude and a medium to inform but also as a giveaway, then there is the tendency that you will put it out on display. Giveaways are normally put out in display on tables, waiting to be taken by guests and with this common occurrence that you can also do, just married postcards will simply add to the plethora of design elements that are in your event. It will ultimately make your wedding packed with so many details and elements that will elicit as a well-thought-of event. You may also see sample wedding postcards. There are tons of ways you can acquire your very own just married postcard by simply buying designs and templates that are already premade. These designs and templates are all available online which makes it more accessible and easier to acquire. You may also see bridesmaid postcard templates. You simply have to choose the design and template of your choice, pay for it online through different modes of payment, and then simply download the file to your personal computers. However, there are reasons that justify why going for premade just married postcard designs and templates are easily the most ideal option compared to its other counterparts (i.e. having it custom made). Premade designs and templates are generally more affordable because of how it is designed. Commonly, when you want something tailored to your needs you opt to have it custom made, but such option can sometimes cost you a lot, making it an impractical choice. However, going for premade just married postcard designs and templates can cost you twice lower than having it tailor-made to your demands. This is because the graphics artist who usually creates premade designs and templates create based on their own preference and not someone else’s. And ultimately because they are not obligated to follow any demands and requests that restrict their creativity. You may also see powerpoint postcard templates. Although premade, premade designs and templates created by talented graphics artist are not being compromised in terms of quality. They are made with the intent of providing top-quality designs at the most affordable prices. So, if you worry that premade designs and templates are no of the best caliber, throw that doubt out the window as it hinders you from trying an option that simply offers you practicality and efficiency all the while being of great quality. You may also see holiday postcards. Considering that most elements on the postcard are already designed and laid out, going for a premade just married postcard will not be such a demanding task for you. Especially when you are inexperienced or have little-to-no knowledge about graphics design. You simply do not need to have an extensive knowledge of different design software or design in general, as creativity and persistence can already get you far. Basically, basic knowledge is more than enough. Also, taking into account these designs and templates are premade, it provides you a medium that can serve as your guide when you start to work on your design or an inspiration you can base off of. Premade just married postcard designs and templates or anything pre-made in general is fully editable and customizable to your preference. With the freedom provided by the option, it also provides an avenue for your creativity to flourish. You can simply do whatever you want with the design and template of your choosing and tweak it or alter it to your preference. Texts, cool fonts, colors, sizes, even a few of the other elements are fully editable and customizable. 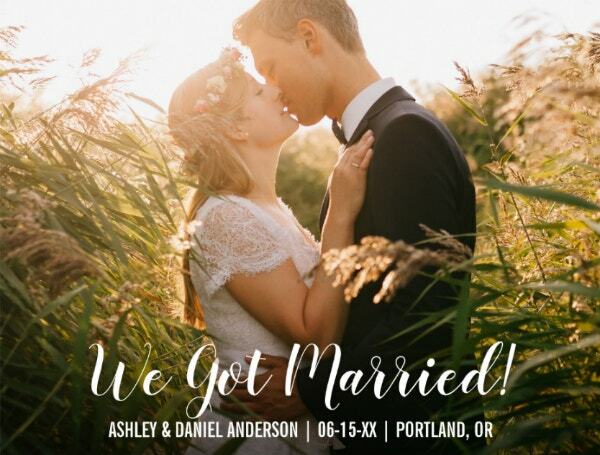 Sometimes, it comes with smart object layers or vector files that enable you to move around elements of the design to create a more unique and personalized just married postcard. Even though these designs and templates are premade, they still come in many different design variations that are perfect for every different preference of different individuals. There are simple and minimal designs for those who prefer a more streamlined and organized postcard, fun and modern designs for those who wish for their postcards to be different from the rest, and of course printed designs that come in many different variations floral, glitter, polka dots, et cetera. Weddings are a beautiful and special affair and it is more special with the people close to you. And if you opt to keep your marriage under the radars of people but still wants to inform them, simply hand out just married postcards for that sincere gesture of informing them. Your marriage should not be kept a secret between just you both, it should be celebrated with the people most dear to you. After all, love is a beautiful celebration. You may also see save the date postcards. If you find this article helpful in any way, do not forget to bookmark this page for future references. And, kindly share this with other individuals or couples getting married and seeking the best just married postcard designs and templates to use and ultimately postcards to hand out. You may also see postcard templates for kids.